I’ve wanted to make oven roasted tomatoes for a couple of years, but never got around to it. My brother John made some recently which spurred me into taking the plunge. In addition to asking friends and family for recipes and tips, I looked at several online to get a picture for various approaches. There are a lot of recipes out there, but with only slight differences in cooking temps, times and methods. 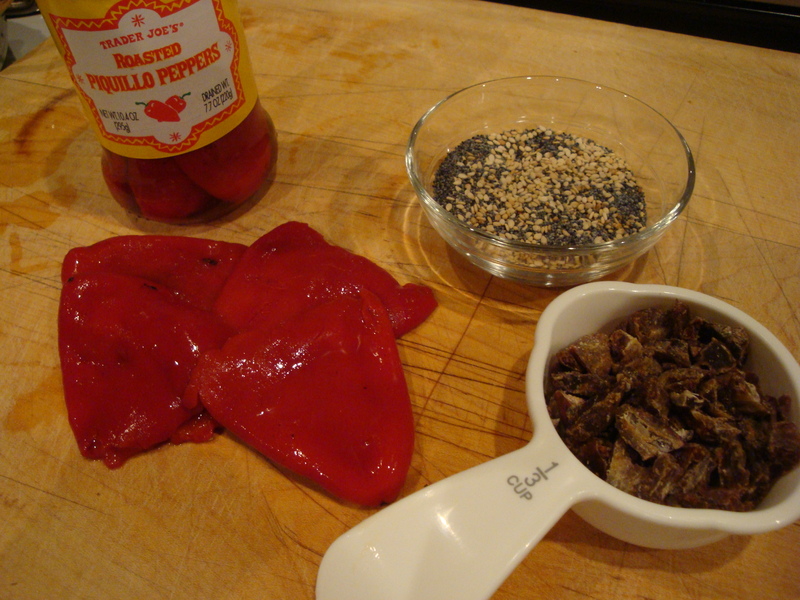 There are two definite camps, however, when it comes to seasoning. One camp uses only salt and pepper and the other adds herbs and garlic. So, always one to see for myself and draw conclusions, I made a batch of each. The results were great in both cases! I have already used the plain in ratatouille in place of some of the fresh tomatoes, and we had the seasoned ones on pizza last night (yum!). 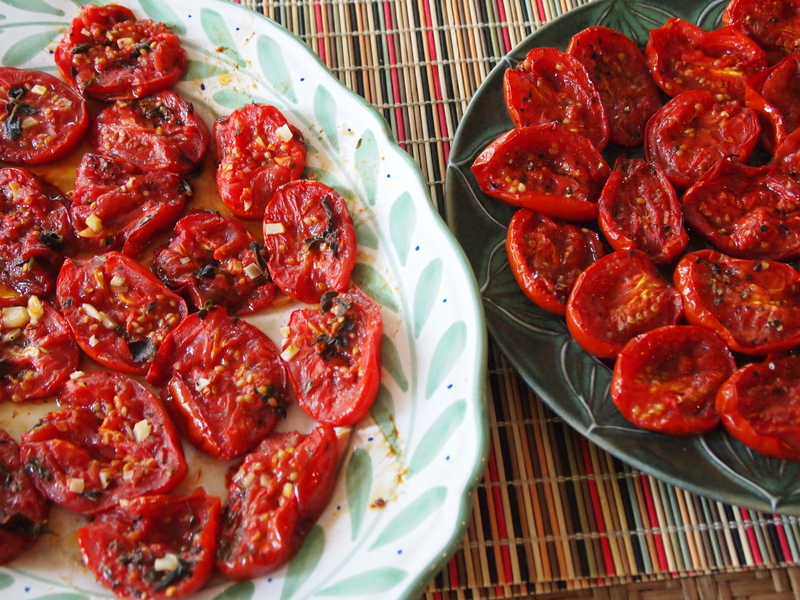 I look forward to making more while it’s still tomato season and to experimenting further with both types for appetizers and in sauces and pastas. I used 10 Roma tomatoes in each batch, but you can use as many tomatoes as you’d like and regular garden tomatoes as well as Romas. My hunch is that if the tomatoes are very juicy, squeezing out some of the juice would aid in the carmelization, but I can’t say for sure. Preheat oven to 375°. Have handy baking dishes or jelly roll pans. 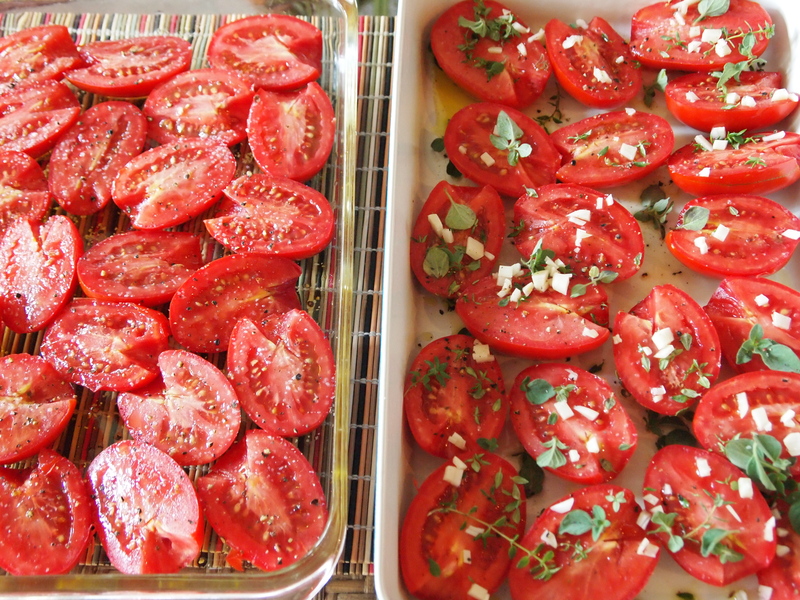 Place tomatoes, cut side up, in a baking dish or jelly roll pan. Drizzle with olive oil. Add salt and pepper and seasoning of your choice. Place pan in preheated oven and bake for 45-60 minutes, until tomatoes start to carmelize. Remove from oven, cool slightly and then remove to a platter to cool completely. Once cooled, remove the skins – they will slip off very easily. These will keep several days in the fridge or you can freeze using freezer bags or containers. I hope to freeze a few packs of these because I can picture how fabulous it would be to get a hit of summer in January! Be judicious about the amount of salt. I used about a teaspoon of kosher salt on the plain tomatoes and felt they were too salty. I used just oregano and thyme for the seasoned version, but I think rosemary and basil would also be good. Don’t be daunted by what the pans look like after! I soaked these for about 30 minutes in very hot water and dish washing liquid and they wiped clean easily – no elbow grease required! I used a Pyrex dish and a Le Creuset cast iron lasagna pan. 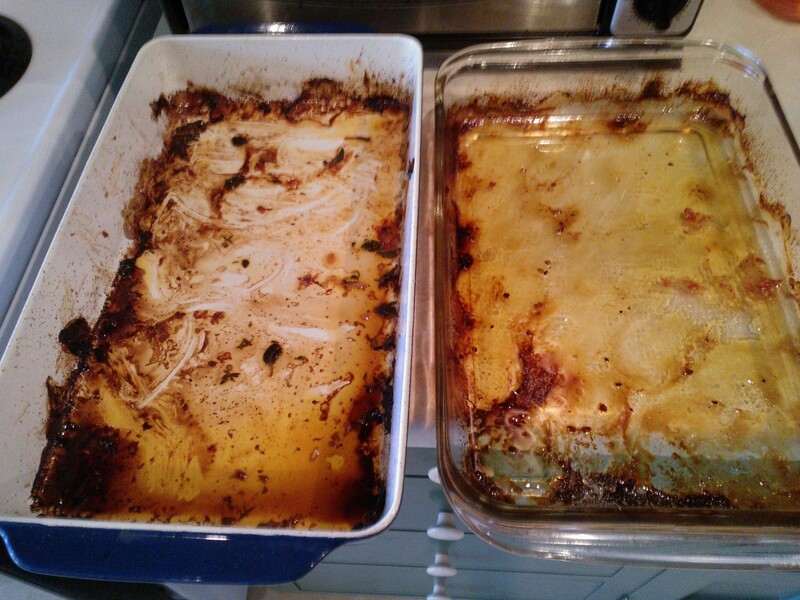 Both worked, but I think the Pyrex had a slight edge in terms of results. This is a delicious casual meal for any occasion that’s a lot of fun to cook and serve for a crowd. Think football playoffs! My brother and I cooked these great pita sandwiches last Sunday and served them with a number of Mediterranean items – hummus, roasted chickpeas, olives, tabbouleh and Corfu salad. 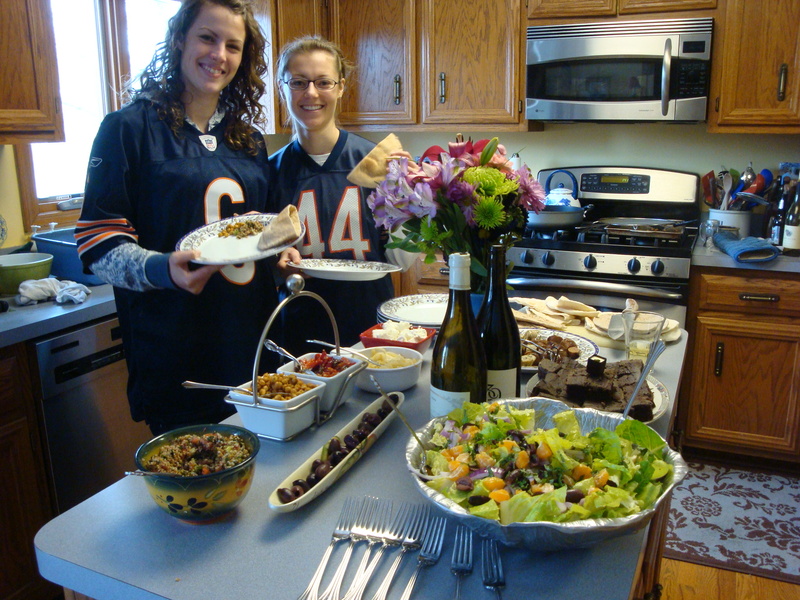 We waited till half-time of the Bears-Seattle game to serve -my niece, Katie and her cousin make it clear who we were rooting for! Good meal, great game outcome! (Go Bears!!) Many sides work with these sandwiches and a peppery Cotes du Rhone or California Syrah works really well. This recipe is comprised of several components – sauteed onions, red pepper-date relish, sausages, feta cheese – that can be assembled into the pita pockets to individual tastes. 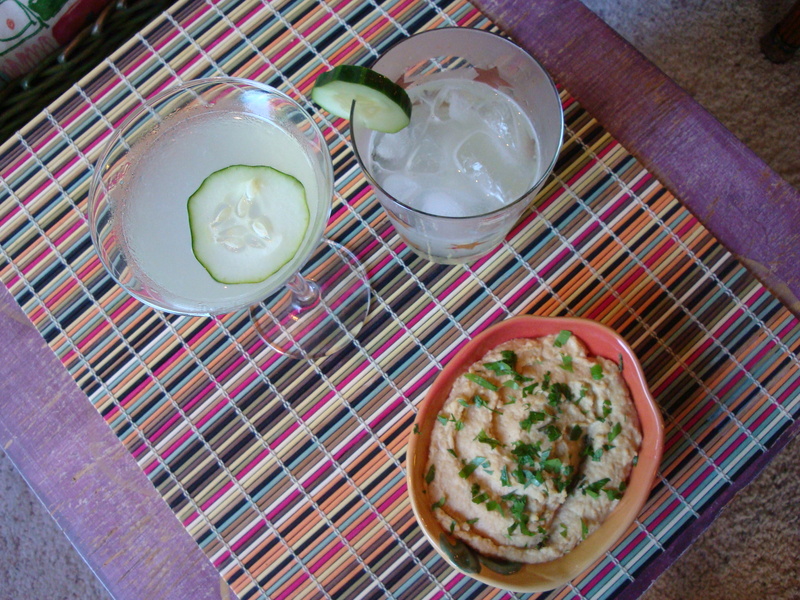 Randy likes to substitute hummus for the feta and these can be made vegetarian by omitting the sausages. 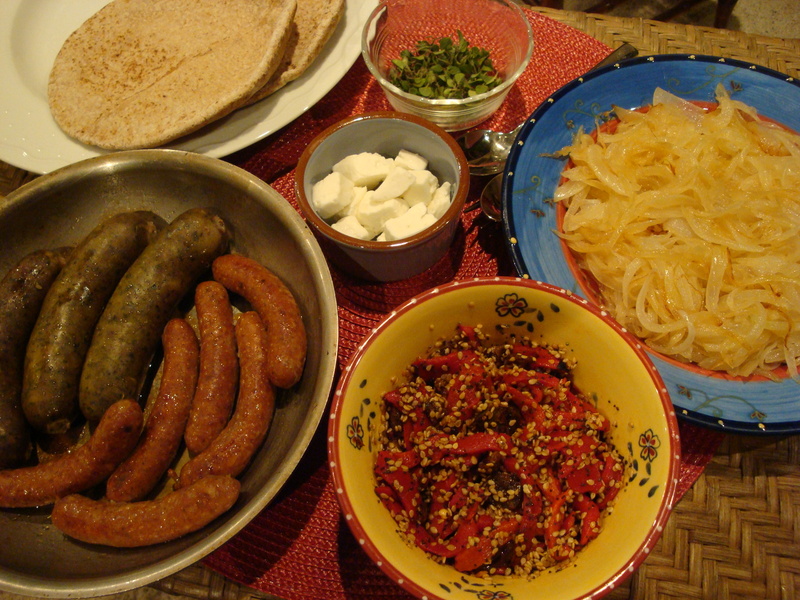 These can also be served as appetizers on toasted regular (non-pocket) pita wedges, omitting the sausage. The amounts specified here served 7 people. All quantities are adjustable to your taste and number of people. Heat the olive oil in a large saute pan or skillet. When shimmering, add the butter. 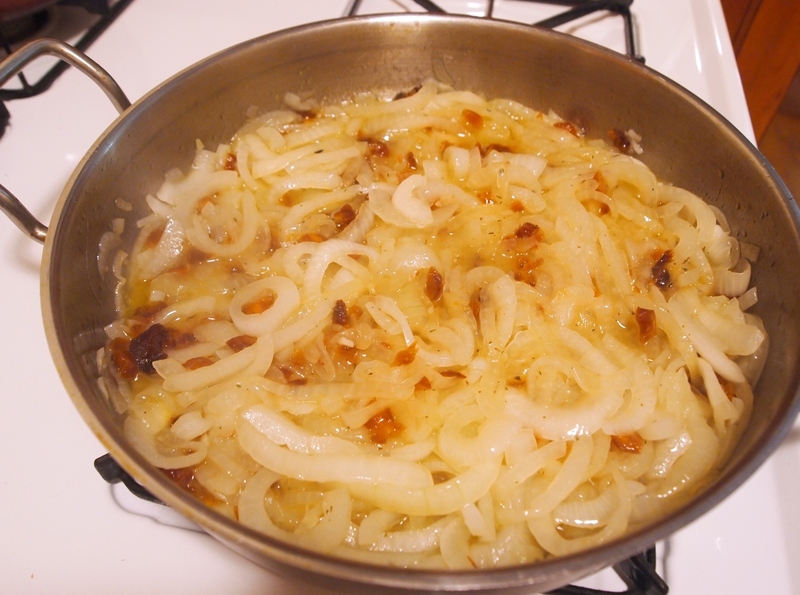 When the butter is melted and bubbling, add the sliced onions. 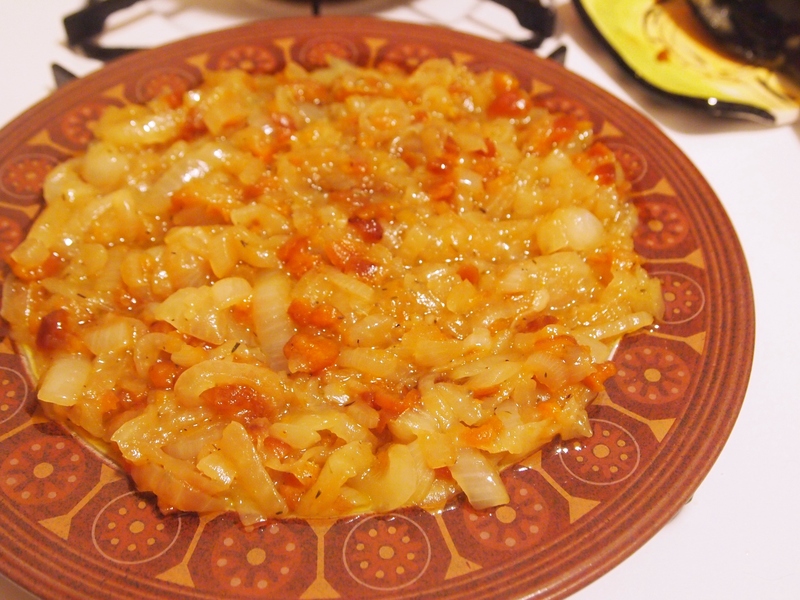 Saute on medium-high heat stirring constantly until beginning to brown – about 10 minutes. Turn the heat down to medium and continue to cook, uncovered and stirring occasionally, until soft and golden. Set aside. NOTE: I heard about a technique for slicing the onions that minimizes the stringy membranes. 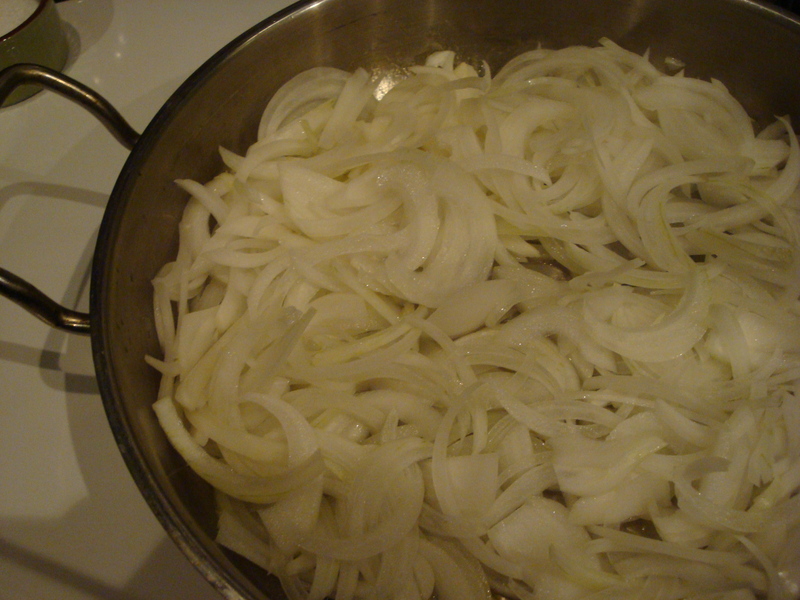 Cut the onions in half length-wise and then slice in that same direction – from top to bottom rather than across. 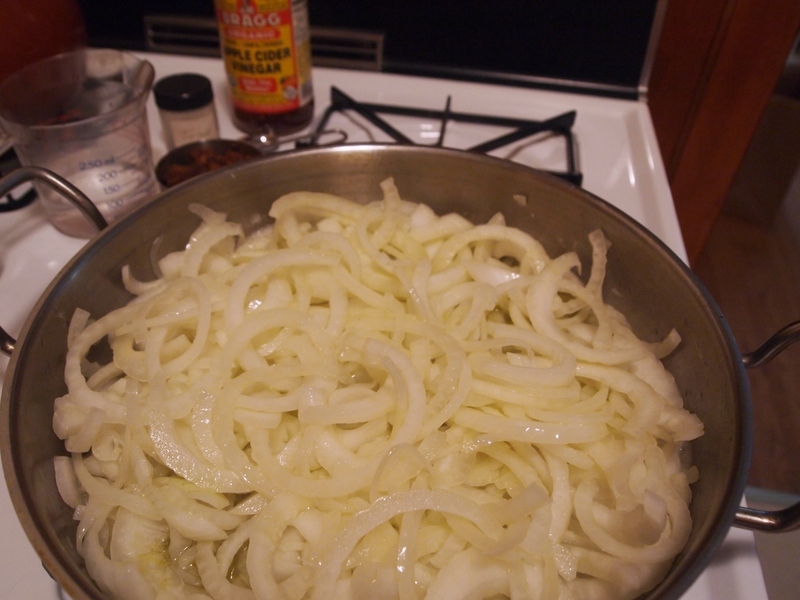 Yellow onions can be substituted for the white. A NOTE ON THE SAUSAGES: If you are near a Whole Foods, brother John discovered delicious lamb sausages from New Zealand in their freezer section – flavored with Sofrito. Some Whole Foods have fresh lamb sausage. I use either fresh-made merguez Moroccan lamb sausage or lamb-blueberry-pine nut sausage, both from Clancy’s Meats in my neighborhood – definitely worth a trip for you Twin Cities residents. We also use some of the fully cooked, highly flavored chicken sausages found at places like Co-ops, Whole Foods and Trader Joe’s. DIRECTIONS: Cook the sausages according to directions till just done, but still juicy. If it’s warm out, you can grill on either a gas or charcoal grill. Cut into smallish pieces on the diagonal. Cut the pitas in half and wrap in foil and heat in the oven till warm. To make the sandwiches, place the onions, sausages, red pepper-date relish and feta into a pita pocket half. Enjoy! This is a delicious dish that is also versatile. 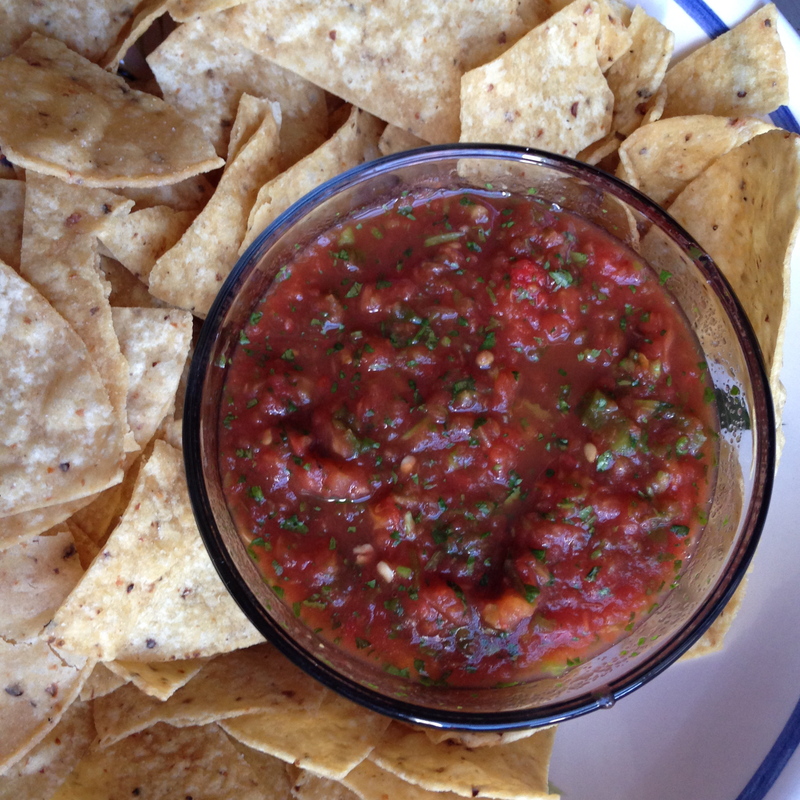 The original recipe called for using it as a topping for bruschetta. We served it at room temperature as a side salad for a cookout meal, and I can also see it served warm as either a side dish or a vegetarian main dish. Many options! Here’s a photo of the finished salad. 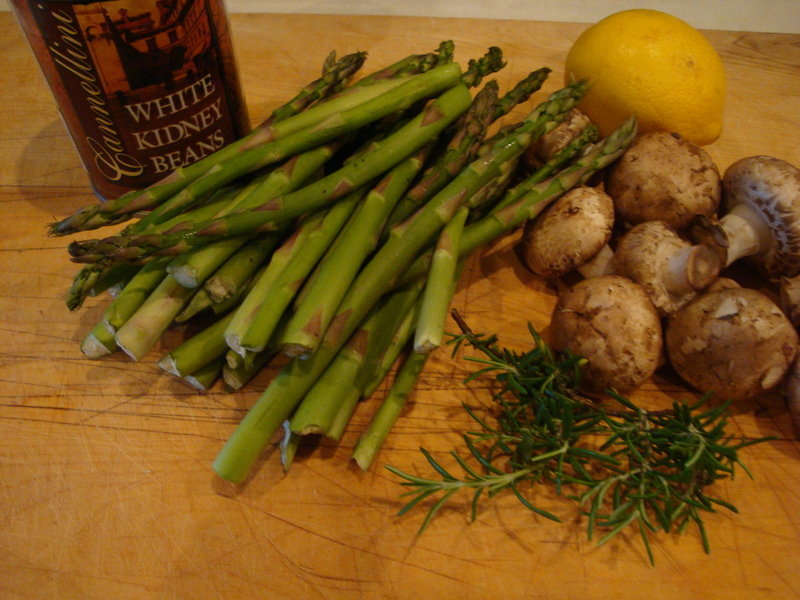 Toss the olive oil with the asparagus and mushrooms (I used crimini). For outdoor grilling, place in a wok or grill pan and place over the fire. Close the lid and cook for 4-5 minutes, until tender, stirring once mid-way through. For oven roasting, place on foil on a cookie sheet or broiler pan bottom and roast at 425 for 6-7 minutes, stirring once mid-way through. Transfer to a serving bowl and stir in the beans. Mix all ingredients and whisk till slightly emulsified. Pour dressing over the vegetable mixture while still slightly warm. Serve at room temperature or chilled. 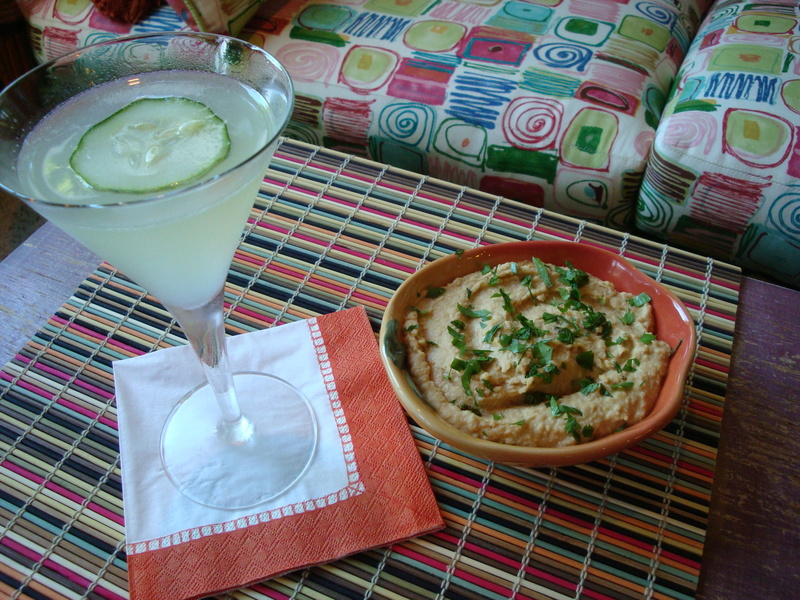 A few years ago, I saw this recipe for an appetizer of baked feta cheese in Food & Wine Magazine. I had never heard of baking feta cheese before, but it looked delicious. It turns out it IS delicious!! It’s super easy to make and a hit when served with baguette, crackers and an assortment of olives. Several types of feta are available in solid blocks vs. crumbles, which is what you will need for this dish. For friends who live in Minneapolis, Bill’s on Lake & Aldrich is the place to get it. For those of you who live near a Trader Joe’s, they carry Greek feta in a block. I prefer French sheep’s milk feta when I can find it. Enjoy this beautiful and tasty dish with a Sauvignon Blanc or a French Pinot Noir. Aunt Suzy actually gave me this recipe years back with her “Dinner in a Box” gift that she gave my husband and I as a wedding gift. It was a really fun gift that I will probably do for someone someday: in the year after we were married, four times we received a box from her that contained a menu with recipes, some ingredients and a few cooking implements to go with that we didn’t have yet. One of the menus contained a recipe for roasted beets, and as a side note she included this recipe, as a way to use the beet tops at another meal (you serve the feta on sauteed beet tops). I’ve used it several times now, and I LOVE it! We’ve even served it at a cocktail party, with slices of crusty bread, and it was a hit. 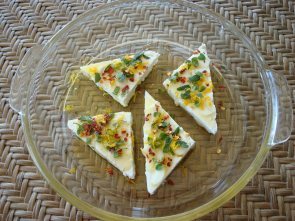 Cut the feta into 4 triangles and place in a glass baking dish. Place the pepper, garlic slices, oregano leaves and lemon zest on top of the cheese. You can vary the quantities of these ingredients to your taste. Pour the olive oil over the cheese carefully so as not to disturb the other ingredients. Marinate 5 minutes to 1 hour. Bake at 375 degrees for 10-15 minutes till custard-like, but not browned. Lift cheese sections onto a serving plate (or individual plates) with a spatula and pour hot olive oil over all. Heat olive oil in large skillet over medium heat. Saute garlic for about a minute, then add greens in bunches and saute until just wilted. 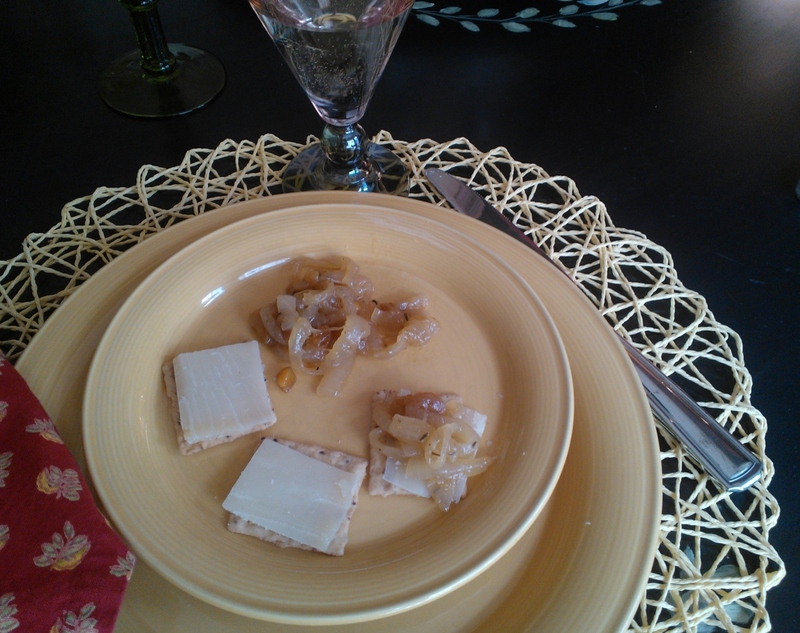 Transfer to serving platter, then arrange cheese pieces over top. Pour hot olive oil over all.